Located on the Caribbean coast of Central America, Belize is bordered by Mexico to the north and Guatemala lying to the west and south. Belize has a flat and low terrain in the north and along the coastal areas; central and southern regions are mountainous, with Doyle’s Delight being the highest peak rising 3688 feet above sea level. 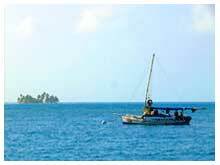 The land mass including around 450 islets and territorial waters is 8867 square miles. The beautiful Caribbean Sea washes onto 175 miles of golden sandy beach along the eastern coastline. A Sailors paradise is the best way to describe Belize. There are so few charter boats in comparison to the vast sailing ground that you can always find a peaceful and quiet anchorage. The ocean waves are broken by the reef, making the waters calmer with less swell. The sailing ground differs from North to South. The northern waters offer short island hops, inhabited cayes with restaurants and bars and shallow turquoise water. In the South the waters are deeper and the cayes slightly more wide spread, giving you great sailing, excellent fishing and crowd free anchor spots. Many of the cayes are uninhabited and provide an excellent habitat for the birds and marine life. There are two types of cayes, one with sandy beaches and palm trees, and another with mangroves and vegetation - these cayes are home to many birds, fish and shellfish. Some of the cayes have been developed into resorts where you can benefit from a bar and restaurant or a diving trip amongst the brightly coloured under water havens of reefs and corals. Snorkeling and diving is great for all levels, with unspoiled reefs, an astounding variety of corals, formations & walls, pinnacles and swim-throughs - Belizean waters are a paradise for ocean lovers. The abundance of marine life here is fascinating with so many varieties of fish, shellfish, turtles, large sting rays, spotted and manta rays, reef sharks and many more. Not forgetting the numerous dolphins, manatees and the amazing whale sharks. Belize's inland jungles and mountains are well worth exploring, and we recommend allowing time on your trip to visit some of the amazing sights you can see here. Talk to one of our consultants about arranging inland tours and accommodation. Hiking is a great way to see the wildlife, beautifully coloured exotic birds and to experience the cascading waterfalls that have drops of over 1600 feet, with cool refreshing rock pools you can relax and take a dip in. The rich sandy soil supports large savannas and heading into the Maya Mountains you will find rivers that you can swim in or “Tube” down, and caves that can be explored by canoe. 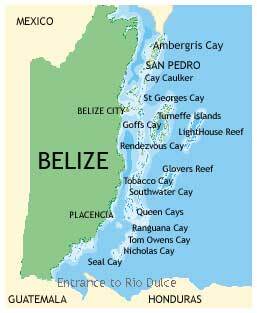 Belize sailing charters can depart from either San Pedro - Ambergris Cay, or Placencia. You can sail bareboat inside the barrier reef, but you will require a skippered charter if you wish to visit any of the outer atolls, lighthouse reef, glovers reef, or the turneffe islands. This option is available with a monohull, catamaran or powerboat and is a superb option for your sailing vacation. Belize is a country that has so much to offer, with friendly people, laid back way of life, fantastic sailing ground and tropical climate it is a great place to explore, relax and unwind. Dynamic and diverse this country is one that will exceed all your expectations.